Confession: I’ve been sitting on this recipe for an eternity, or at least what feels like one. It wasn’t because I felt this recipe isn’t very good, quite the contrary actually. This recipe maybe came a little too good. 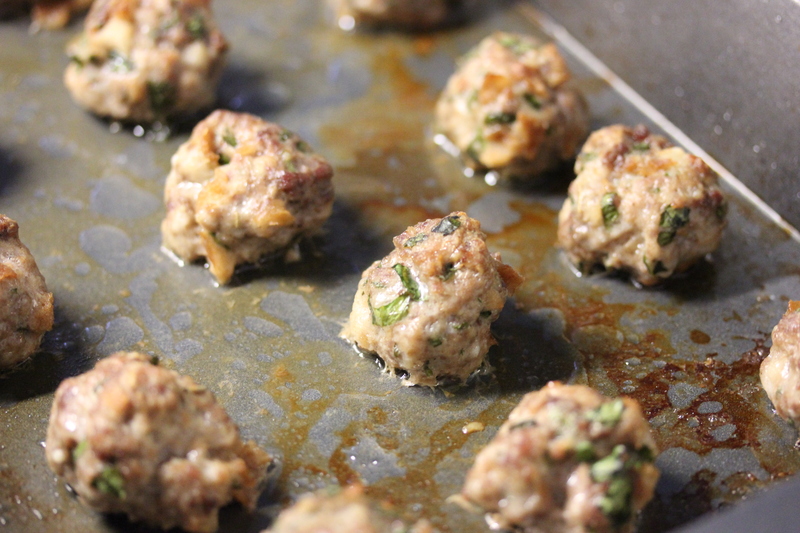 These meatballs happily lived in my freezer for a few weeks, enjoyed as a special treat because they were too good to eat without being fully appreciated. There’s something about a really tender meatball with just a hint of parmesan in a nice, rich red sauce that can be so satisfying. So the merits of the recipe have not been the issue. No, the problem has been my rapidly changing relationship with meat. I’m always worried about the living conditions and the health of the animals I eat, but that’s usually fairly easy to get around by purchasing meat raised under standards that I can stomach (even if the price is a little hard to). But shortly after these meatballs graced my kitchen I started to read – probably a little too much – on the health risks of eating meat. I’ll stop before I get on my pulpit, but I will say that the way that I think about meat and health has changed a lot, especially given some of my own health issues. Thus has begun a slow process to become as much of a vegetarian as possible (I say as possible because it’s not always easy for me in terms of feasibility or self-control). So this brings me to the meatballs. It’s not my position to judge the choices that others make with food, and while I will probably choose to have the self-control to not make these for myself again, that shouldn’t stop anyone else (besides, they are so good). So to my meat loving friends I say enjoy, to the vegetarians – next time I’ll try with tofu. 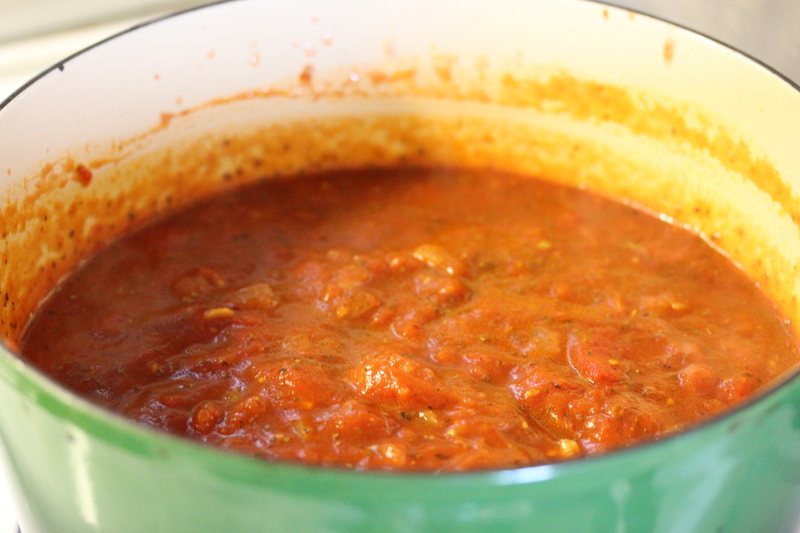 If you don’t have whole tomatoes feel free to use diced ones instead, even cans of sauce should be fine. I used ½ lb pork ½ lb veal and ½ lb beef. You could use any combination of these or just one, do what you like. 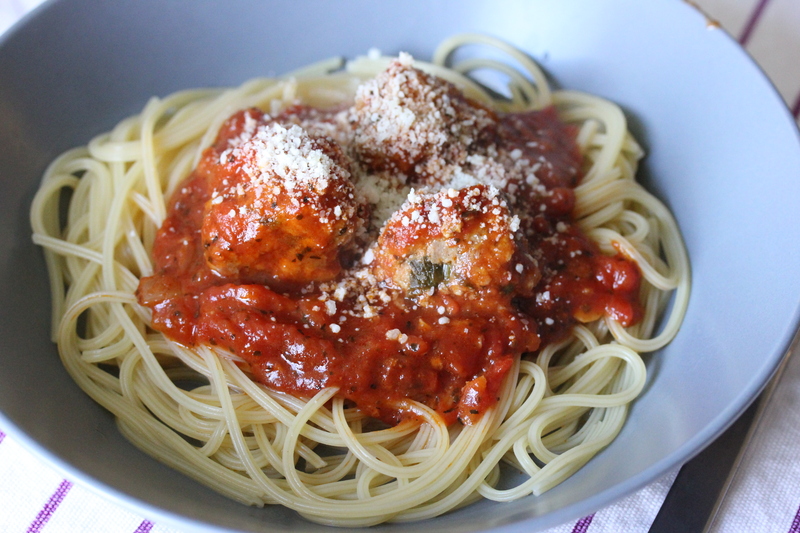 Instead of using milk for the meatballs I used water and I thought it was fine, but milk is more traditional. Put a generous amount of olive oil in a large pot and bring to medium heat. Dice an onion and add, cook until soft (10 minutes or so). Chop up garlic and add to onions, cook for just a few minutes until fragrant but not brown. Add the can of tomato paste and mix well with onion and oil. Let cook for 5 minutes, making sure to stir frequently so that it doesn’t burn. Save the can and fill with water, add to the paste and mix. Let cook for another two minutes. Bring about a third of a cup of water or milk to a simmer in a small pot. Once simmering, add the ripped up bread pieces and turn off the heat. Let sit for about five minutes or until cool enough to handle. Squeeze out the bread and save, discard the liquid. This makes the bread nice and soft and a good binding agent for the meatballs. 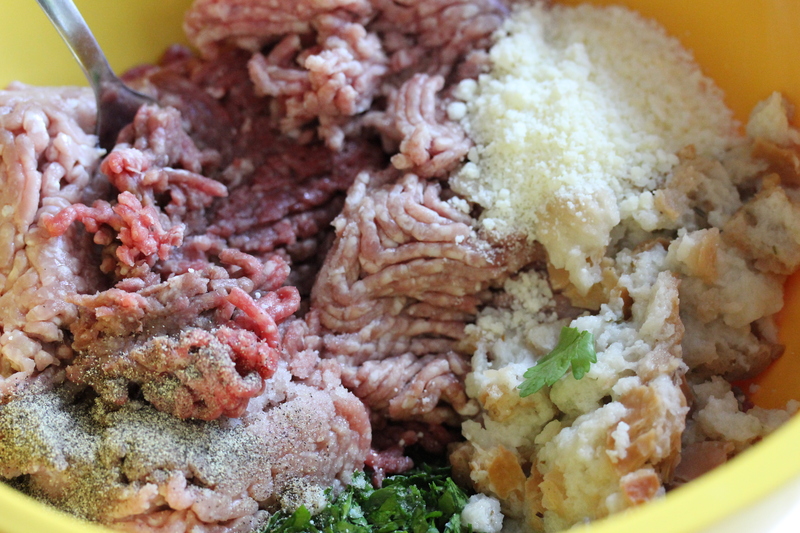 In a bowl combine the meat, parsley, cheese, salt, pepper and garlic and bread. Mix with a fork or your hands (I used my hands because I thought it was easier). 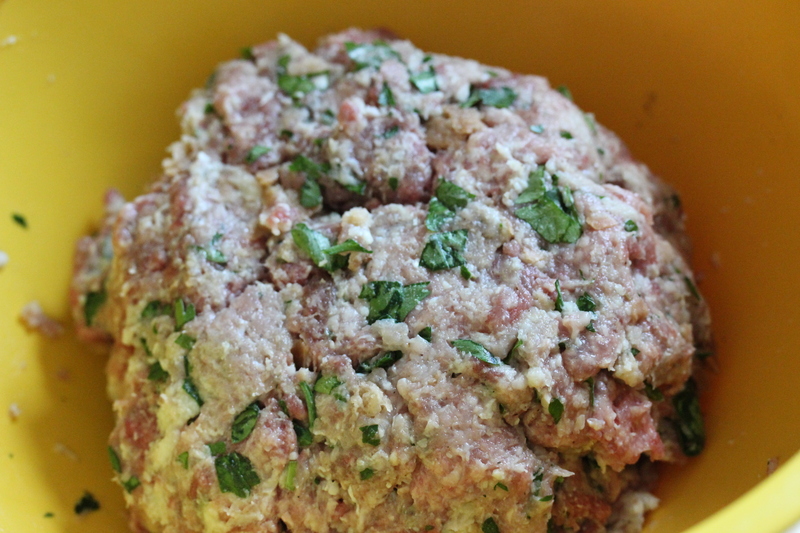 Mix just until everything is combined, don’t overdo it – too much kneading will make the meatballs rubbery, so do just enough to bind the ingredients together but no more. Pull off small bits of the mix and roll into balls in the palm of your hand. 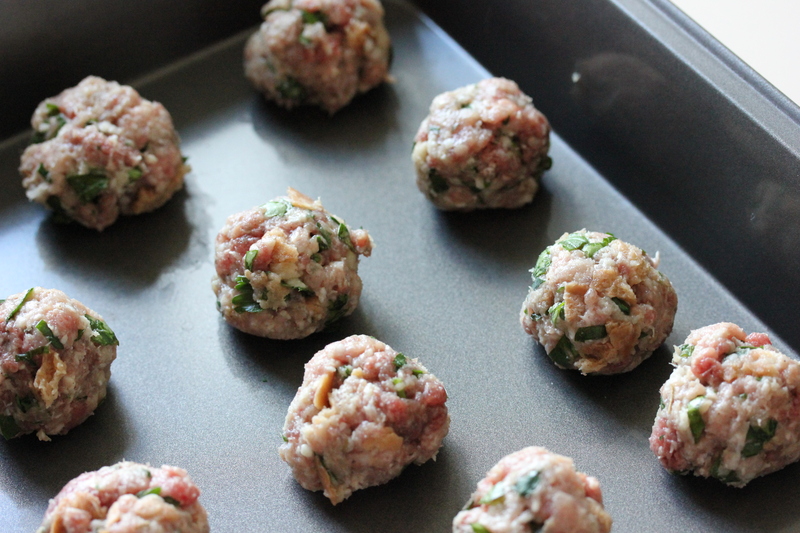 You can choose any size you like, I opted for a smaller size so I got about 40 meatballs out of it. Line into two baking pans or brownie pans so that there is a little space between them. Add at least ¼ cup of water to each pan and then place into the over on a middle or high rack. Let cook for at least 20 minutes or until they are sealed and some juice is coming out. If the pans get too dry add a little more water so that the grease doesn’t burn. 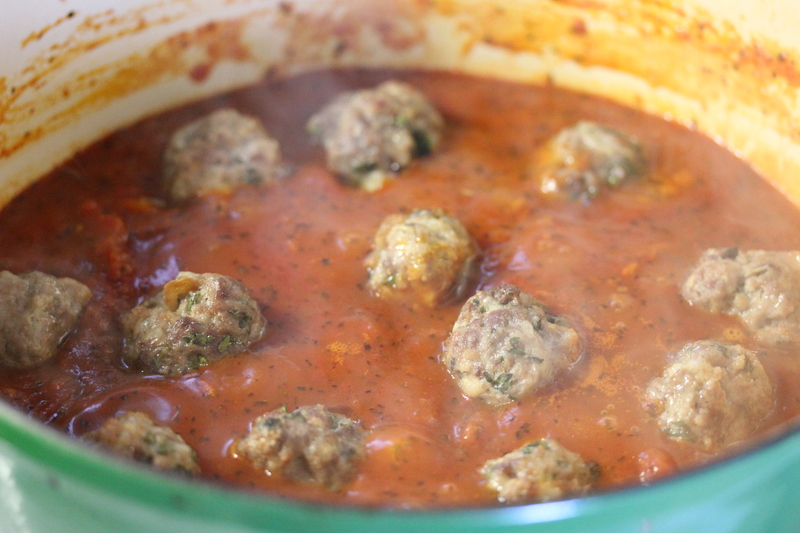 Once the meatballs are done, gently drop them into the sauce. They should be mostly cooked through by this point, but you should make sure the sauce is at a gentle bubble and let them cook for another five or ten minutes. While this is happening, boil your water and cook your pasta al dente. 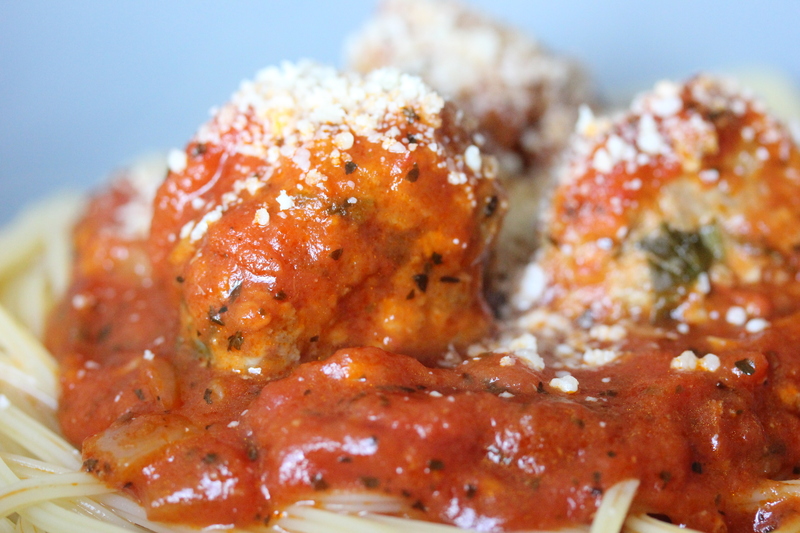 Serve pasta in a beautiful bowl with a nice dollop of sauce and a few meatballs on top!